Mills comes to Maine from Bucknell University, where for nine years he served as director of the Samek Art Gallery. He joins a museum known both for innovative, high-profile exhibitions and as a model of the academic art museum — a laboratory where students, faculty and the community interact with art that resonates across the disciplines of a liberal arts education. “I’ve known of Bates for many years from afar,” says Mills, and was drawn by the museum’s exhibition track record as well as its facilities and collection. Mills adds that he has come to the college at a singular moment in its history, as President Elaine Tuttle Hansen has asked the institution to renew its emphasis on the arts as one part of Choices for Bates, a collaborative, college-wide strategic initiative. Spawning initiatives that include the creation of a Bates Arts Collaborative of faculty and campus arts presenters, “this is a wonderful situation, one with many opportunities for the arts and the college,” says Mills. “Dan Mills achieved great things at the Samek Gallery,” says Dean of the Faculty Jill Reich. “His exhibitions were adventurous and provocative, truly ahead of the curve. His vision will strengthen the Bates museum’s role in enriching the arts scene in southern Maine. Mills, who started at Bates Sept. 13, led the Samek through a remarkable transformation. During his tenure there, the museum attracted national recognition for the energy and variety of its exhibitions, often focusing on contemporary art. Samek shows traveled to major cities, other academic museums and China. Recent Samek exhibitions of note include Xiaoze Xie: Amplified Moments (2010-12), An Academic Resource: Highlights from the Permanent Collection (2010) and Regeneration: Contemporary Chinese Art from China and the U.S (2003-06). “My philosophy has always been to organize exhibitions that would be terrific anywhere, but to do them for the institution I work at,” says Mills. He also dramatically expanded campus access to the Samek’s permanent collection. “The collection changed from being a ‘best-kept secret on campus’ to a high-use research field and resource for disciplines across campus,” he notes. The latter achievement speaks directly to Mills’ views on the ideal role for an academic art museum. Whether by opening a collection to the campus or curating a dynamic exhibition, it’s all about connection: connecting programming in visual arts to students and faculty in all manner of academic disciplines. Strongly committed to museum involvement in the community beyond campus, Mills is intrigued by Bates’ overall engagement with Lewiston-Auburn. “There’s a real service and outreach component that’s in Bates’ DNA, and that I find very appealing,” he says. Mills is also an accomplished artist whose work, in a variety of media, explores themes and imagery including cartography, humor, imperialism, cartoon characters, landscape and portraiture. Since 2009, he has had solo exhibitions at Sherry Frumkin Gallery in Santa Monica, Calif., the Tianjin Academy of Fine Arts Museum in China and at several academic institutions. The Perceval Press, actor Viggo Mortensen’s publishing company, produced a hardcover book based on his “US Future State Atlas” series of drawings in 2009. Mills earned his bachelor’s degree in fine arts at the Rochester Institute of Technology and his master’s at Northern Illinois University. He previously directed the Gibson Gallery at the State University of New York, and served as curator for the art program at the First National Bank of Chicago. He is married to Gail Skudera, an award-winning artist whose work, combining aspects of pictorial weaving with painting and photographic transfers, has been exhibited widely throughout the Midwest and eastern U.S. They have three adult children. Mills succeeds Mark Bessire, who now heads the Portland (Maine) Museum of Art. Founded in the 1950s with a donation of materials relating to pioneering American modernist Marsden Hartley, the Bates College Museum of Art embraces the influential role that academic museums play in integrating art, scholarship, collaboration and unfettered innovation to champion diverse perspectives and explore pressing issues of global and local scope. The museum has gained national recognition for such innovative exhibitions as Green Horizons, a 2007 exploration of sustainability that anticipated a surge of national interest in the topic; and 2006’s Cryptozoology: Out of Time Place Scale, encompassing artists’ commentary on the world of unknown, rumored or hidden animals. The museum is noted for its attention to emerging art from China, with shows such as the Bates-curated Documenting China crossing the U.S. through the Smithsonian Institution Traveling Exhibition Service. Comprising some 5,000 objects, the museum collection is particularly strong in works on paper, among which such masters as Paul Cezanne, Henri Matisse, Pablo Picasso, Mary Cassatt and Walker Evans are represented. Moreover, the museum has built on its founding donation of Hartley materials to reflect the myriad dimensions of the Maine experience. Artists including Carl Sprinchorn, Neil Welliver, John Marin and Robert Indiana are represented in the collection. The museum devoted its summer 2010 exhibition to a retrospective of Joseph Nicoletti, a member of the Bates studio art faculty who is also a renowned realist painter. 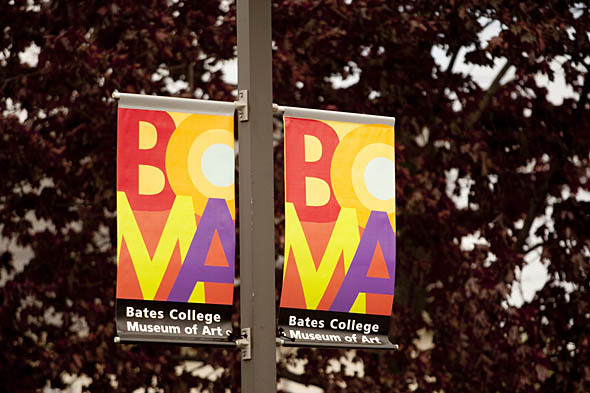 An exhibition venue and academic resource for students and faculty in visual arts and culture, the Bates museum also intersects with disciplines as diverse as dance, English and physics. In addition, the museum welcomes approximately 15,000 visitors annually, including public-school students in organized programs, and is a valued destination for Maine residents and visitors alike.